Representing an advance in boiler technology, Hurst Boiler receives patent for revolutionary new internal counter-flow device that improves boiler efficiency and is available as an optional design feature on any packaged Hurst Scotch Marine and Euro Series Boilers. Hurst’s advanced technology and engineering works as an economizer and aids to absorb more heat from exhaust gases by utilizing feedwater potential in a unique water-to-flue gas counter-flow design. Hurst Boiler is pleased to announce the patent approval for its revolutionary new counter-flow device designed to improve boiler efficiency. Integrated inside of the pressure vessel, Hurst’s optional counter-flow device is factory-built into the company’s innovative Thermal Master Counter-Flow Boiler Series and can be added to any of Hurst’s packaged Scotch Marine and Euro Series boilers, depending on desired efficiency requirements. 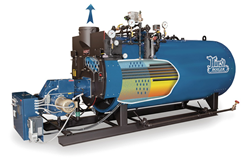 Representing a new concept in the design of conventional fire tube steam boilers, Hurst’s new counter-flow device improves boiler efficiency without increasing the heat transfer surface area and flue gas pressure drop through the boiler. Hurst’s advanced technology and engineering works as an economizer and aids to absorb more heat from exhaust gases by utilizing feedwater potential in a unique water-to-flue gas counter-flow design. Performing the same function as a traditional external economizer typically used with conventional steam generation systems, Hurst’s patented internal counter-flow device captures the lost or waste heat from the hot flue and stack gasses of the boiler. In accordance with patent approval, calculations were performed by computer model of Hurst’s counter-flow boiler under typical conditions. Relative to other boilers having traditional designs, tests determined that the device improves boiler efficiency by as much as 3%, depending on working conditions. Unlike the bulky assembly of a typical external economizer that has separate housing and ductwork in addition to the boiler housing, Hurst’s streamlined, internal counter-flow device requires no external housing or support. As a result, boiler room costs can also be further reduced by savings associated with installation, maintenance and labor. Hurst Boiler & Welding Company, Inc. has been manufacturing, designing, engineering and servicing gas, oil, coal, solid waste, wood, biomass and hybrid fuel-fired steam and hot water boilers since 1967. With installations across all industries worldwide, Hurst Boiler is recognized for the highest code standards, innovative engineering and design, and renewable, sustainable solutions for green building design and operational efficiency. Visit http://www.hurstboiler.com or call (877) 994-8778. Watch the Hurst Boiler video on YouTube.